One of your direct reports is about to attend a development seminar focusing on influence and leadership skills. Although the program is known worldwide as Positive Power and Influence®, the specific version used in your organization may have another name. The purpose of this Management Briefing is to provide you with information that will make the program more productive for your direct report, for you, and your organization. The first part of this briefing describes the rationale and underlying principles of the program, key concepts involved, and program results. It highlights how the Program helps the participants increase their effectiveness. 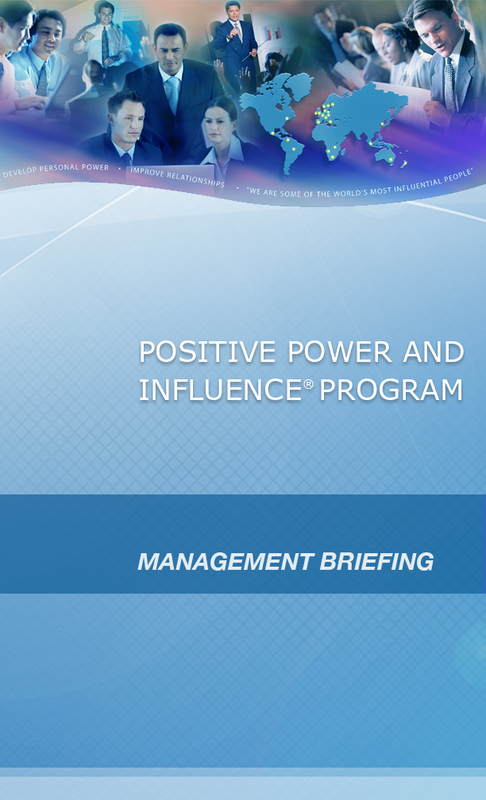 In the second part of the document, Dr. David Berlew, one of the developers of the The Positive Power and Influence Program, overviews the workshop. He discusses the impact of the program on organizational effectiveness. In addition, he offers some suggestions for Pre-Program and Post-Program meetings with your direct report to help maximize the return on your investment in this training. By reviewing this material you can contribute significantly to the effectiveness of the training your direct report will receive, and thereby enhance this person’s development. Thank you for making this investment in your employee and your company. If you wish to receive a password, please contact Cynthia Smith at clsmith@smsinc.com and you will be able to download the Management Briefing Package.